Kauai is nicknamed “the Garden Isle” because of the beautiful lush green mountains and valleys. The Royal Coconut Coast lines the east side of Kauai, and consists of white sand beaches backed by a beautiful mountain range, and the magnificent mount Wai’ale’ale. This mountain is the main volcano that formed Kauai, the last eruption occurred over 5 million years ago. The explosion created the entire east side of Kauai and formed the unique shape and topography of the island. What’s left of Wai’ale’ale today is a dramatic crater which open towards the Coconut Coast. Wai’ale’ale is consistently covered in fog, mist, clouds, or all of the above. The crater collects that water high in the mountains and through waterfalls and streams; it slowly drains into the ocean. The major river flowing out of the Wai’ale’ale crater is the Wailua River. This river meets the ocean right in the heart of the Royal Coconut Coast. The mountains and land surrounding the area was rich and sacred land. Water was wealth to the Native Hawaiians, therefore the Royal Coconut Coast was a special place because they never had to fear a drought. For these reasons, Wailua was chosen as the first Capital of Kauai. 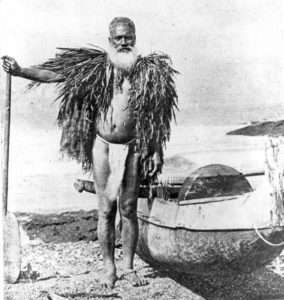 The first settlers of Kauai are believed to be Marquesans and other Polynesians that sailed to Hawaii around 500 A.D. With no guidance but the stars and the trade winds, it is a testament to their navigational skills that they found the Hawaiian island chain in the middle of the great Pacific. Tahitians are said to have come to the island after the Marquesans. They were more powerful and eventually forced many of the Marquesans to flee to neighboring islands. The first settlers from Polynesia sailed from over 3,000 miles away. They only brought with them the most important plants and foods, many of which are still abundant today in Hawaiian culture and diet. One of most important plants is taro, named kalo in Hawaiian. It is a rich starch and became a staple of the Hawaiian diet. The plant holds significance in the Hawaiian culture and is used to make many foods, most notably, poi, which is often served at a luau. Kauai’s high chiefs made their home there as it was considered one of the most sacred areas in all of Hawaii. The Royal Coconut Coast was the most desirable place to live, even in the early days. Fresh water was always available and the land was perfect for growing taro, yams, and bananas. The coconut trees grew in plenty, and was a very useful plant since it served as a source of food, utensils and fiber. Westerners began arriving in Hawaii in the late 1700’s. Captain James Cook is credited for being the first European to discover the islands; he first landed in Waimea, on the west shore of Kauai in January 1778. Cook originally named Hawaii the “Sandwich Islands” after the fourth Earl of Sandwich. Hawaii quickly became a common trade stop for sea voyagers and a popular destination for missionaries and other Westerners eager to find their piece of paradise. Kauai has a unique history being the oldest inhabited of the main Hawaiian Islands and the only island that was not conquered by King Kamehameha in his attempt to unite all the Hawaiian Islands. King Kamehameha twice built up his army in hopes of conquering the last islands of Kauai and Niihau. Both times he was unable to make the voyage to Kauai, first due to a rebellion in 1796 and then in 1803 an outbreak of disease prevented the King and his army from leaving Oahu. Kamehameha recovered and continued to build his army; the soldiers, weapons, and ships Kamehameha had at his discretion far surpassed any of the resources available on Kauai. The King of Kauai and Niihau at the time, King Kaumualii, decided to avoid the inevitable bloodshed and instead came to a peaceful resolution with Kamehameha in 1810. Kaumualii continued to serve as governor of Kauai under the united Hawaiian Kingdom ruled by King Kamehameha. Flume crossing from bluff over river to mill carrying came from higher elevations to the mill at Kealia. Makee Mill in background. 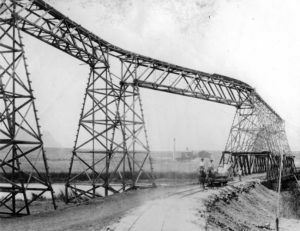 Two men on horseback, in foreground, pulling flatbed train cars on tracks across the bridge. Sometime before 1900, probably around 1890. The coconut trees that give the east side its name are said to have been planted for a large coconut planation. However, not much information is available about it, as other crops quickly dominated the island’s agriculture scene. The Polynesians were the first ones to bring sugar to Hawaii, but it originates from the island of New Guinea over 10,000 years ago. It is a member of the grass family and like bamboo is very useful because it is strong and grows quickly. Native Hawaiians enjoyed sucking on the stalks to taste its sweetness, but they did not know how to extract the juices in order to make sugar. Sugar cane was actually used by Kauaians for medicinal preparations and used by religious kahuna, or priests, as a love potion. Sugar became a profitable crop once a process was perfected to extract the juice from the raw cane. The first working sugar extraction operation and mill was on the south shore of Kauai, in the town of Koloa in 1835. After the success there, others joined the industry and sugar became the main source of Hawaii’s developing economy. The first sugar plantation to open on the east side was Makee Sugar Company in 1877 in Kapa’a. James Makee, an experienced sugar planter was backed King David Kalakaua. A sugar mill was built at Kealia, and the plantation town around Kapa’a began to grow. The Lihue Sugar Plantation was also expanding quickly and more sugar land was established around the Wailua area. The east side of Kauai is mainly, rich, flat land that stretches from the ocean to the steep mountains. Some of the valleys and low lying areas were marshland, staying consistently wet from passing showers and ocean mist. The marshland was perfect for growing rice and taro, with its rich soil and lots of sunshine. Another crop, in addition to sugar, was emerging as a profitable venture in Hawaii. Pineapple was first grown commercially in Hawaii in 1899 but it wasn’t until after the success of James Dole that pineapple became a profitable venture. With lots of fertile land available, the Hawaiian Canneries Co. was established in 1913 in Kapa’a. The town of Kapa’a began to thrive after the pineapple cannery opened, as people moved in and small business began opening to support the growing demand. Kauai has become a large melting pot of peoples and cultures, mainly due to the plantation era. The local people of Kauai are mostly descendants from the immigrants that came to the islands to work the plantations that boomed in the mid to late 1800’s. People came from all over the world, including Japan, China, Philippines, Portugal, Puerto Rico, Spain, and Germany. Sugar in particular dominated the islands for over one hundred years; it was the main source of revenue and a way of life for most of the people on Kauai. The economy on Kauai prospered from the sugar and pineapple industries until the 1950’s. Labor strikes started occurring and it had a devastating effect on both the sugar and pineapple industries. Politics and business were completely changed when Hawaii became a state in 1959. Agriculture production became too expensive once taxes and fair labor laws came into effect. Statehood eventually led to the demise of both industries. The pineapple canneries in Kapa’a closed in 1962 and is now the site of a popular resort. The sugar plantations operated as long as they could, the Lihue Sugar Plantation was one of the last operating and but in 2000 it also shut down. After Hawaii became a state, many things changed on the island and for the people who lived here. The plantation era slowly ended and a new source of revenue became prominent, tourism. Rita Hayworth, star of Miss Sadie Thompson in canoe with children. Lagoon at Coco Palms, 1953. First movie filmed at Coco Palms after Lyle Guslander bought the property. From the Grace Buscher Guslander Collection. Tourism began to thrive in the 1960’s. 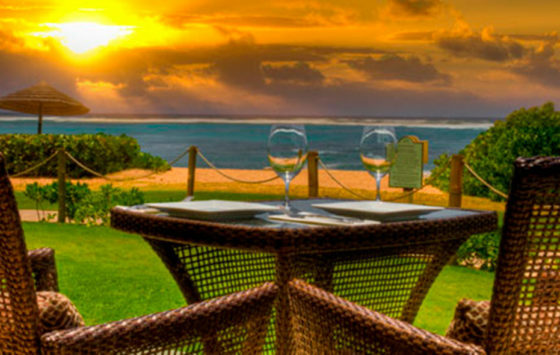 A few hotels were built, one of the first built on Kauai was Coco Palms, a beautiful beachfront resort right in the heart of the Royal Coconut Coast. Elvis Presley frequented Kauai and the Royal Coconut Coast; he filmed “Blue Hawaii” at Coco Palms, a now historic landmark fronting the Wailua River. Filmmakers found Hawaii an ideal location for movies dating back as far as the early 1900’s. Kauai in particular has become a popular filming destination because of its raw, natural beauty, and its ability to look like so many different places around the world. Hollywood loves Hawaii for many reasons, including its close proximity to the mainland U.S., the warm weather, and due to the fact that there are no real predators to be wary of when filming in the jungles. One of the most popular films to feature Kauai was Jurassic Park. Many jungles, mountains, and valleys of the east side became filming locations and some remnants still exist. The posts from the gate that opened to welcome you into Jurassic Park can still be found in the jungles of Wailua. Over 60 feature films and television shows have been shot on Kauai. A popular television show in the 1980’s was filmed on Kauai as well. Fantasy Island features many famous landmarks that you can visit, the most recognizable is Wailua Falls. This beautiful waterfall is located on the Royal Coconut Coast and is easily accessible by car. It was featured in the opening credits of the show. In 2007, Ben Stiller brought an all-star cast to Kauai to shoot the movie Tropic Thunder. Most of the movie was filmed on the east side of Kauai. The ranch land and sprawling fields and jungles on the Royal Coconut Coast, was once primarily dominated by sugar cane, now proved to be the perfect backdrop for the movie that was supposed to be taking place in Vietnam. Prominent mountain ranges and beaches can easily be detected in the film. Over 60 feature films and television shows have been shot on Kauai over the years, others include: South Pacific, King Kong, Raiders of the Lost Ark, Six Days Seven Nights, Jurassic Park I, II, III, Soul Surfer, Lost, Pirates of the Caribbean: On Stranger Tides, and The Descendants, just to name a few. There are even tours now that will take you around the island to explore many of the famous movie sites and locations.